PD. 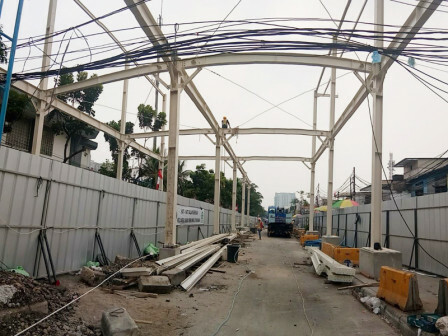 Pembangunan Sarana Jaya installs steel building frame for skybridge or multipurpose crossing bridge (JPM), Tanah Abang, Central Jakarta.
" Installed bridge frame 's length is around 120 meters"
"Installed bridge frame 's length is around 120 meters from midway crossing of Jl. Jatibaru Raya that leads to Cideng and its reverse direction. While its height is around 40 meters," informed Yoory C. Pinontoan, President Director of PD. Pembangunan Pasar Jaya, Monday (8/27). He explained, currently skybridge construction has entered on site phase. It means steel material is ready and assembled according to submitted design. It is done in 24 hours within two working shifts, at 04.00-19.00 and 19.00-04.00. "Process in making holes and foundry are done up to the middle part or A11, then east and west side or A6," he explained. Previously, 80 percent of Tanah Abang Skybridge framework is done in factory using knock down system. In other words, steel framework and structure is made in separate locations. "After new bridge is completed, it will be shipped to Tanah Abang then it will be assembled like what we do now," he conveyed.